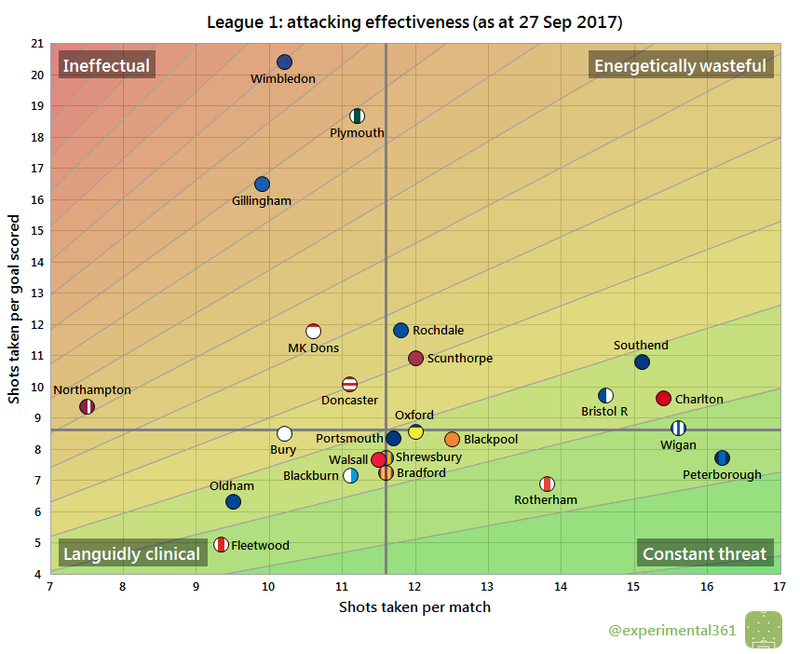 As most EFL clubs have now now played 10 matches, it’s worth a proper update to the scatter graphics to see how things are shaping up. Each of the four graphics is explained briefly below and at length here. Wigan have been the division’s most dominant side so far, taking around twice as many shots as their opponents. Meanwhile both Northampton and Gillingham have spent a lot of the season on the back foot, due to a shot-shy attack and overly-permissive defence respectively, which has surely contributed to both changing managers already. Peterborough are in the top right quadrant as usual, although along with Charlton and Bristol Rovers their attack is looking more good than their defence looks bad. 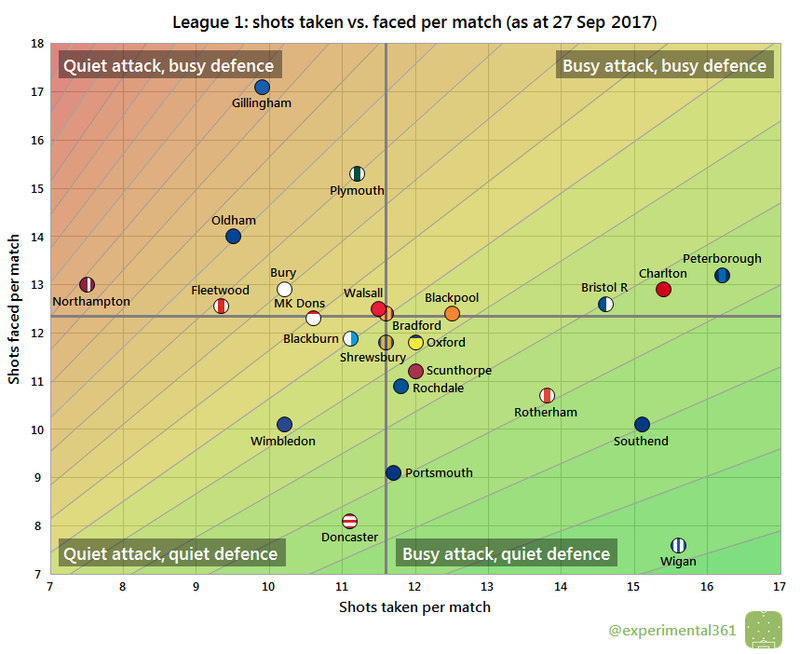 Newly-promoted Doncaster and Portsmouth have adapted better in defence than attack so far, but both already look like top half teams overall. 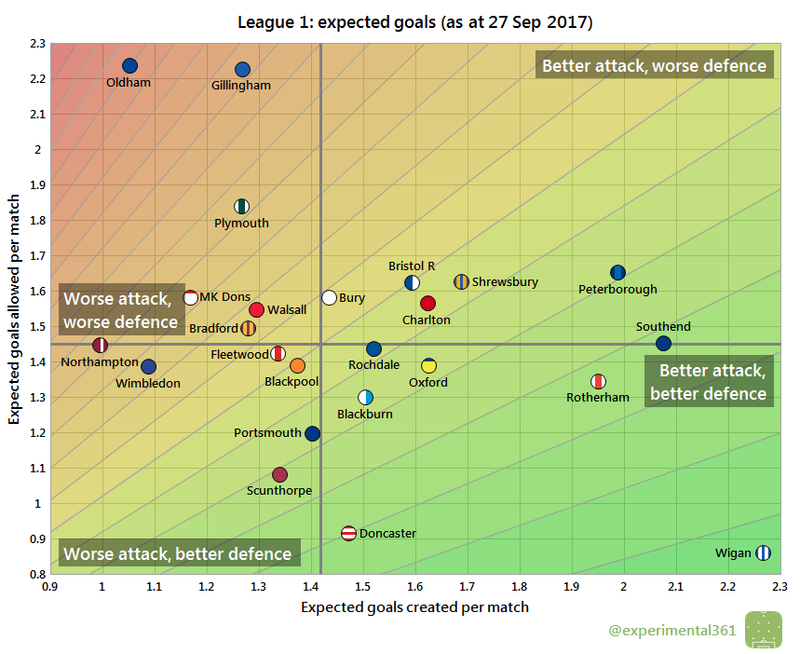 The trio of Wimbledon, Plymouth and Gillingham haven’t had much luck up front so far: they’re comfortably the most wasteful finishers in the third tier. Argyle have struggled to find the net despite creating a respectable number of chances for a newly-promoted side. Meanwhile Fleetwood have been all about quality rather than quantity so far, with fewer chances created than anyone except Northampton but the most clinical attack in the division. 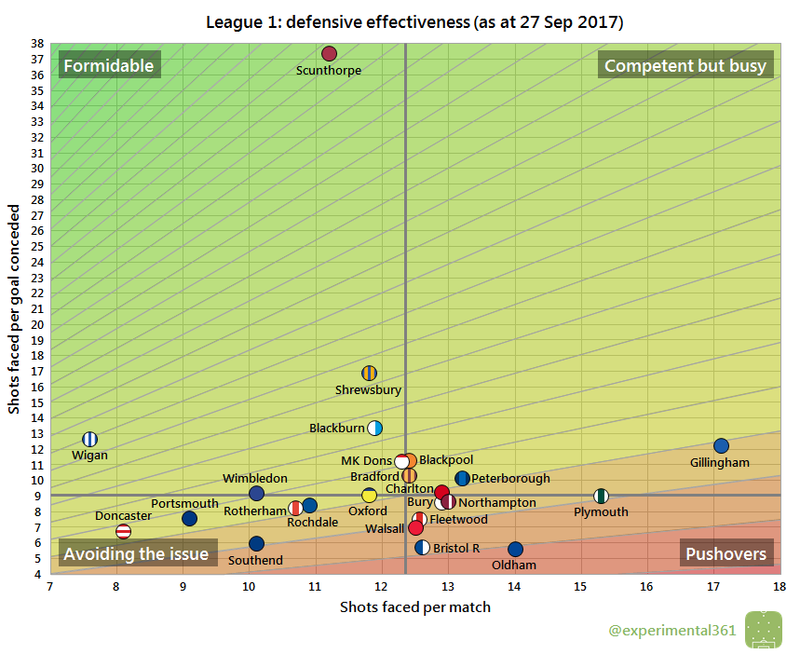 Peterborough are the only one of the five most industrious attackers to have converted their chances at an above-average rate. Every season there’s a team which starts with a graphic-breaking level of performance – nobody likes a show-off, Scunthorpe. The Iron’s defence has been imperious so far, to an extent that I can’t see lasting over a whole season (and therefore the next iteration of this graphic will hopefully look less stretched). Surprise league leaders Shrewsbury have also benefited from a resilient back line so far, and Wigan‘s miserly defence is also absorbing a lot of punishment for each goal conceded. Gillingham have been asking a lot of their back line, while Southend have been one of the better sides at restricting their opponents’ opportunities but are leaking with frustrating regularity. Wigan look to be the most impressive performers at both ends, and therefore look well-equipped to bounce straight back into the Championship. The trio of Peterborough, Rotherham and Southend have looked impressive going forward but less so at the back, while the reverse is true for Doncaster and Scunthorpe so far. Three of the current bottom four – Oldham, Gillingham and Plymouth – unfortunately look to be there on merit, while fellow strugglers Northampton and Wimbledon have seen decent defensive performances undermined by blunt attacks.